Исследования, проводимые в рамках этой темы, направлены на предоставление критического анализа, доказательств и практических рекомендаций по улучшению структуры Глобального фонда. Aidspan будет продолжать анализировать управление и прозрачность Глобального фонда как на уровне Секретариата, так и на страновом уровне. Мы проведем Финансовый анализ предыдущих грантов Глобального фонда и свяжем этот анализ с результатами реализации грантов и показателями здравоохранения на страновом уровне. При четко очерченной Стратегии Глобального фонда по вопросам гендерамы исследуем процессы Интегрирования принципов гендерно-ориентированныхподходова в программы Фонда. 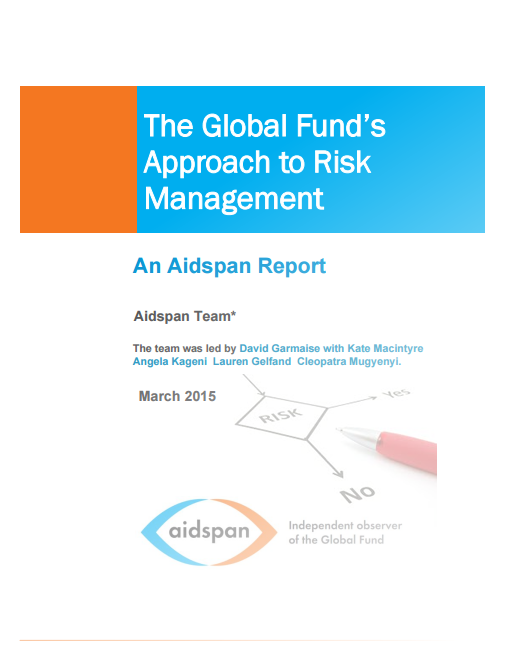 Aidspan describes the Global Fund's new Risk Management Policy. This short paper summarizes different aspects of the risk policy including a definition of terms, the approach to operational risk management with the risk register, and the risk differentiation framework. The paper examines the trends in costs of medicines to treat drug susceptible and drug-resistent tuberculosis. The trends include a comparison between the High Burden Countries, as categorized by WHO, and the other countries that all receive or have received Global Fund support. Data come from the Price Quality Reporting system and are compared across the years 2010 – 2013. 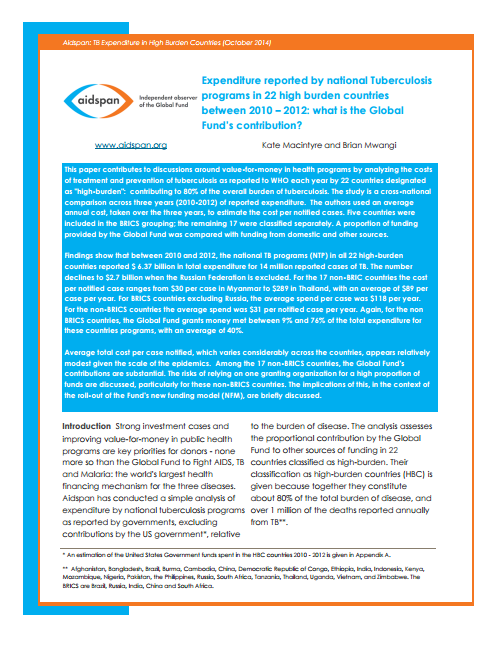 Expenditure reported by national Tuberculosis programs in 22 high burden countries between 2010 – 2012: what is the Global Fund’s contribution? This paper contributes to discussions around value-for-money in health programs by analyzing the costs of treatment and prevention of tuberculosis as reported to WHO each year by 22 countries designated as “high-burden” – i.e., contributing to 80% of the overall burden of tuberculosis. The study is a cross-national comparison across three years (2010-2012) of reported expenditure. Sub recipients (SRs) are country level organizations directly responsible for implementing Global Fund programs. Their role is central in providing services to the populations of need. Little research has been done to understand their experiences and document their opinions on how Global Fund operations can be improved. 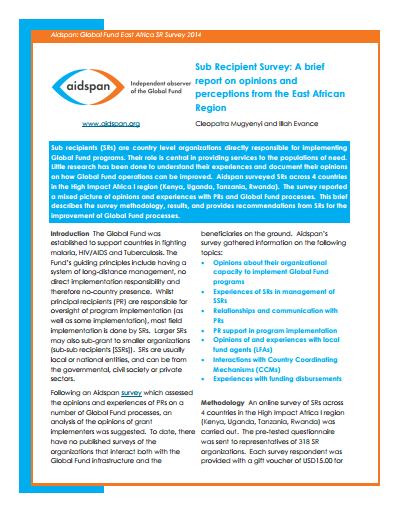 Aidspan surveyed SRs across 4 countries in the High Impact Africa I region (Kenya, Uganda, Tanzania, Rwanda). The survey reported a mixed picture of opinions and experiences with PRs and Global Fund processes. This brief describes the survey methodology, results, and provides recommendations from SRs for the improvement of Global Fund processes. This Guide provides advice on how to build a strong and effective CCM. This third edition expands considerably on what was contained in the first and second editions. Recent developments at the Global Fund, including the introduction of the new funding model (NFM), involve an enhanced role for CCMs. In light of these changes, this third edition has been expanded to include new sections and chapters based on suggestions and recommendations by readers of the second edition. These new chapters include content on the NFM, the Global Fund’s CCM Funding Policy and the CCM eligibility and performance assessment process introduced in 2014. This publication is designed to provide practical guidance on building, strengthening and effectively running a CCM. The first and second editions of this Guide are now superseded, but can still be downloaded in Word and PDF.